One of the most difficult tasks in coaching is turning around a losing football program. In basketball one great player can be the difference; in baseball a couple of pitchers can make a cellar dweller into a contender but in football you need to revamp your roster and restore the right attitude. 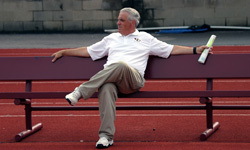 Fred Goldsmith has been the Head football coach at three traditional “have-nots” and been an assistant coach at schools that were in the turnaround process. This gives Fred tremendous insight about what it takes to go into a difficult situation and turn the program into a winner. As an assistant coach he helped Ken Hatfield turn around the Air Force Academy program and the followed Ken to Arkansas to turn the Razorbacks into Southwest Conference Champs He also was the Defensive Coordinator for Rudy Hubbard at Florida A & M and they had success returning that storied program back to the glory days of Jake Gaither. As a Head Coach Fred did the impossible and turned around the Rice football program, even Uncle Ben couldn’t win at Rice. Fred went 23-21 in five seasons in Houston including a second place conference finish. Goldsmith’s next stop was Duke and in year one turned in an 8-4 record and he won the Bobby Dodd Award for National Coach of the Year. His last stop was Lenoir Rhyne, a DII school in North Carolina with not much of a winning tradition and in his fourth season posted a 7-4 record. Tony: Who were the biggest influences in your coaching career? Fred: First would be Joe Paterno. I hung around the program in 1968 and 1969, two undefeated seasons so I really got to see what a great program looked like. Then came Rudy Hubbard at Florida A & M. Rudy was a Woody Hayes disciple and was relentless about fundamentals. He also had a great work ethic that spread throughout the staff. He always wanted the staff to be growing and improving so he brought in coaches to clinic with us. He also made the players recite poetry so they would speak better in public. Rudy Hubbard really cared about the total education of a player. Doug Dickey from the University of Florida was an influence because he involved the coaches’ families with the players. He really preached a family atmosphere. And of course Ken Hatfield was a big influence. He was a master of overcoming adversity. His philosophy was you either have to do things better or do things different. At Air Force we didn’t have better players than our opponents so we did things different and installed the Wishbone and turned that program around. That was a great experience. Tony: I have used that same philosophy throughout my career after hearing Coach Hatfield speak at a clinic. What’s your overall philosophy of coaching football? Fred: The most important thing is to enjoy coaching. Recruit kids you enjoy being around. When coaches and players enjoy each other’s company it becomes a lot of fun and you succeed together. I think it’s important that football is fun. Tony: What advice do you have for coaches at “have-not” situations? Fred: Do it different or do it better. Coach Hatfield believed in either scoring 40 points or 40 minutes of possession. We ran the Wishbone to accomplish this. When I went to Rice, I hired assistants that could recruit Texas so we could get better players. Then we installed Dennis Erickson’s Offense which was based on high percentage, low risk passes. We controlled the ball with the quick passing game. The hitch was a run to us. This was the same offense Erickson used later at Miami won a National championship. Then we comprised a defense with a unique blitz package. So teams had to prepare for a unique offense and a unique defense in the same week. We did the same thing at Duke. Our blitz package gave people fits and we had a great scheme against the Zone Read scheme. Tony: What about the option? Fred: We installed the Flexbone at Lenoir Rhyne after the first year and it made all the difference. In our last season we went 7-4, their best season in many years and the triple option was one of the main reasons. It kept our defense off the field and we had a good year. On defense we used the philosophy of “make ‘em win the way they don’t want to” –in other words take away what they like to do and make them do what they don’t want to do. So if I’m facing a Wishbone team I’m going to make them beat us throwing the football. They will not run the ball up and down the field. Tony: Last question; what are the three things that you feel are important to winning football games? Fred: The first thing is you have to run the ball to control the clock. Controlling the clock protects your defense. The second thing is to prevent the big play on defense. The third thing is to win the turnover margin. When we had our 8-4 year at Duke we were second in the nation in turnover margin. When Northwestern under Gary Barnett had that big season when they won the Big Ten and went to the Rose Bowl, the led the nation in turnover margin. If you don’t hang on to the ball and get some take-aways you’re in trouble. Those are the three things I think you have to do to win. Tony: Coach, thanks so much for you insights and your time. Dig Deeper by J.C. Watts, Jr.